TPi’s Ste Durham witnessed the collaborative four section visual spectacular. When Ellie Goulding first appeared on the general public’s radar in 2009, few would have suspected that she would go on to produce the kind of elaborately scripted stage show that TPi was on hand to witness at Manchester Arena. The production value was certainly upped from previous tours, with a huge video and lighting package, bespoke staging and striking drapes to rival those of mainstream pop’s biggest names. Tour Manager Rebecca Travis first joined the Ellie Goulding camp four years ago, and has overseen performances across the world, in venues of all shapes and sizes. For the artist’s first full arena run, the team turned to seasoned Production Manager Bob O’Brien to lend his experience (and unflappable disposition) to the Delirium tour cycle. Another of the aforementioned female contingent on the Delirium tour is Lighting and Co Show Designer Cate Carter of Bryte Design. 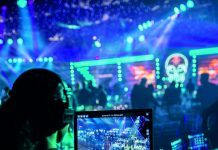 In close collaboration with Director of creative production agency Black Skull Creative, Dan Shipton, she helped develop the show from its embryonic beginnings to the full stage production in effect at arenas across the UK. The pair started work together in the autumn of 2015 with rehearsals due to begin in January 2016 at Litestructures on Wakefield’s Production Park. From the first meeting that they had with Goulding and her management around the artist’s kitchen table, Carter and Shipton were certain that they had to bring nothing less than their A game. Carter and Shipton were informed from the off that the Delirium tour had to a big step up from what had come before. This included a unique design, a discernible narrative thread and special moments within the show to mark these transitions. In short, a show some way from the artist’s understated beginnings – more akin to those of contemporaries such as Katy Perry or Lady Gaga whose productions aren’t afraid to flirt with the theatrical. Shipton continued: “We started by sectioning the show into chapters that grouped Ellie’s music together. This allowed us to give each chapter a visual identity that would transcend the costume, choreography, screen content and magic moments within the show. The chapters begin to explore versions of Ellie that link to the music. We start with Ethereal Ellie who is dressed in white and represents Ellie in her purest form. She invites us into her world that quickly introduces us to Energised Ellie who is more fun and outgoing. Lite Alternative provided the lighting rig for the Delirium tour. The moving head fixtures consisted of 62 Ayrton MagicDot-Rs, 16 Philips Vari-Lite VL 3500 Wash FXs, 25 Martin by Harman MAC Viper Profiles, 14 MAC Viper AirFxs, 12 MAC Viper Performances, 44 MAC Aura LED Washes, and 25 Clay Paky Sharpy Spots. These were underpinned by 12 i-Pix BB4’s, 22 Martin by Harman 3000 DMX Strobes and three Robert Juliat Lancelot 4k followspots, as well as over 50 4-lite and 2-lite molefays. A separate rig for the B stage section included eight Philips Vari-Lite VL 3500 Wash FX Luminaires, 20 Clay Paky Sharpy Spots, 12 MAC Viper Performances, and a Robert Juliat Lancelot 4k Follow Spot. 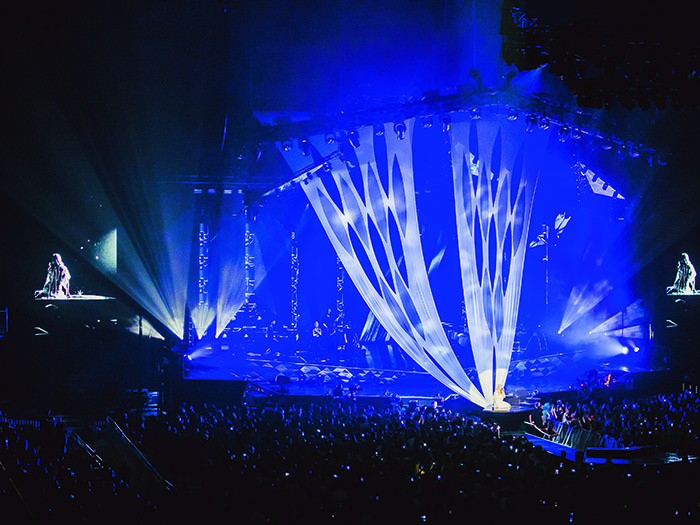 To accentuate the fragmented theme, Total Solutions Group manufactured four mirrored, triangular lighting pods that were flown above the video screens. They were made up of a truss along one edge and ladder frames along the others. The truss had some of the MAC Vipers hung from the underside, while the ladders had some of the Ayrton MagicDot-Rs uniformly spaced along each edge. These were used to reflect the moving lamp beam off the mirrored surfaces, creating some spectacular effects. 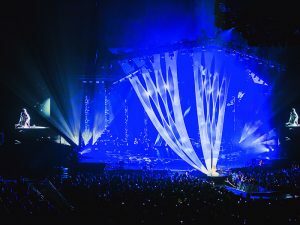 While Bryte Design and Lite Alternative were members of the Ellie Goulding ‘Class of 2012’, the team added a new supplier in All Access to introduce staging elements that were previously absent from Goulding’s bag of tricks. The company supplied raised tech wings that housed a cosy monitor world at stage left and doubled as a riser for Goulding to use during the show. The package also included all high-shine flooring and a catwalk from the stage that detached to allow Goulding could glide to the B stage. Another facet of the show design was the selection of visual draping elements supplied by ShowTex. The company provided two golden LurexVoile 100 drapes that were hung in the middle of the stage during the two opening acts, which were then dropped for the arrival of Goulding by a ShowTex Kabuki system. Later on in the set, during the song Explosions, Goulding appeared on stage in a white dress, dragging two giant elastic wings made of PolyStretch P8 CS Matt behind her. These were fully stretched out during the song and later, courtesy of another Kabuki drop system, seemed to vanish into thin air, as seen on the current cover. Another of ShowTex’s creative contributions was a number of bespoke coloured banners made from a mixture of Spinnaker CS and glow in the dark Phosphor Foil strips for the ultimate psychedelic special effect during one of the high-energy sections of the evening. The visuals were further accentuated by eight CO2 jets and around half a tonne of gold confetti, provided by Pyrojunkies and overseen by Stu Wickens. PRG XL Video provided the kit for Haddow, as well as three LD techs and an engineer. Video Engineer / Projectionist Ray Gwilliams looked after the cameras filming IMAG content, which were operated by LED Tech Tim Bolland, Truck Driver John Burgess, and Head Rigger Amos Cotter, who operated the camera situated at FOH. 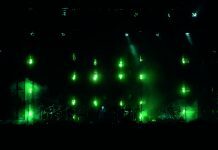 The stars of the video design were the triangular ‘shards’ of FX 11 (11mm) LED screen, which stretched across the back of the stage and was meant to represent the fragmented nature of the show’s concept. The shards were flanked by three MC7 (7mm) IMAG screens – one on each side and one flown in the centre. All of the LED surface could be used as one canvas to show content or split to display a combination of content and live camera shots. Haddow also used an MA Lighting grandMA2 onPC command wing to busk in the camera feeds, which was especially useful between songs when Goulding spoke to the audience. Due to the condensed pre-production time, content creation for Delirium was tackled by a number of different studios, with Bryte Design’s Paul ‘Pablo’ Beckett collating the material from the different studios and producing a number of the pieces himself. All of the transitional films and bespoke footage of Goulding was handled by NorthHouse Films, while London’s Atticus Finch created a portion of the animated visuals and Belgium-based studio Fabrique Fantastique produced another batch of song-specific custom content. Shipton added: “The video content is hugely important part of the design. The screen content also became hugely important in making the transitions between the different sections within the show work. We wanted to take Ellie into the screens and show her morph into the next version of herself. We spent time shooting the various ‘Ellies’ with NorthHouse Films, who then did a great job of producing the transition VTs. 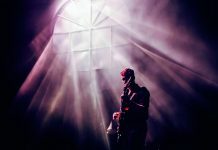 One of my favourite parts of the show is the acoustic version of Devotion where we strip everything back to a single spot on Ellie playing her guitar with a white outline on the screens before she sinks into the stage, the track drops and Digital Ellie appears on the screens.” As the whole show was timecoded, Haddow decided to try switching to d3 Technologies media servers for the tour, saying that he felt it was the perfect fit for the job. He went on to speak highly of the “great quality” of the servers’ SDI input cards, which resulted in a much clearer camera picture than he was used to, and the efficient way that he added effects using d3. “I use the onPC command wing to control Notch digital effects in an analogue way,” he explained. While Adlib were contracted to supply audio for the tour, FOH Engineer Joe Harling’s preferred system for Goulding, the d&b audiotechnik J-Series, had to be sub-hired from Entec Sound & Light. Systems Tech George Puttock explained: “Audio Tech Lee Fox Furnell is a freelancer that does quite a lot of stuff with Entec so he knows what he’s doing! We have 20 J8’s per side with eight J-SUBs flown behind and to the side we have a 16-deep hang of 12 J8’s and four J12’s. On the deck we’ve got a line of eight J-INFRA subs and eight J-SUBs, all driven from the new d&b D80 amplifiers. Harling has chosen a DiGiCo SD5 to mix the show, running Waves externally on an Apple Mac mini as well as a variety of outboard effects. One of the techniques that Harling utilises to overcome this challenge is by keeping the show’s overall decibel level a touch lower than your average pop show. He continued: “There is also lot of processing going on with vocals, you have to rely on multi-band compression rather than broadband because, when someone uses their head instead of chest voice, they’re not really expressing a lot of air, so odd notes will stand out. As Goulding owns a selection of Sennheiser gear, it made up a large chunk of the gear on stage, along with a variety of beyerdynamic and Shure gear for instrument microphones. Her main and spare microphones were two of the four prototype Sennheiser 9245’s in the UK, running into an EM 3731-II receiver, while the backing vocalists used e945 wireless microphones. Another thing that Harling and Puttock were particularly proud of was the “vibey as possible” FOH they had created at Manchester Arena, complete with carpet, rope lights and a vinyl player. The same look had been recreated in monitor world, tucked underneath stage left, where I was greeted by the amiable pairing of Monitor Engineer Mike Flaherty and Audio Crew Chief Marc Peers. With sound check approaching, Flaherty revealed Goulding had only attended two all tour. “She’s really easy going and polite. If there’s something she needs she’ll just ask but she tends to just let us get on with it,” he said. Flaherty was also using DiGiCo, this time an SD7, to stay on top of the 12 channels of Sennheiser 2000 Series IEM, as well as additional output mixes for the dancers. While the majority on stage rely on their Jerry Harvey Audio JH16 in-ear moulds, the keyboard and bass positions have an L-Acoustics SB18 each. The drummer has two bi-amp 15-inch wedges to stay in touch with the bass. All of the on stage subs run using Lab.gruppen PLM 10,000Qs. Phoenix Bussing is another of the go-to companies for the Ellie Goulding crew, having provided its services since 2012 when one bus and a trailer would do. For the UK leg of the Delirium tour, Phoenix supplied three crew buses and a band bus, with another artist bus being added for the European run. All were 14 metre double deckers and were laid out in the various configurations required for each touring party: 16-berth, 14-berth and an artist suite. Phoenix Bussing’s Andy Gray said: “It was great to be working with Rebecca again on this tour, and to have Bob joining her as we have worked with him previously on other tours. Dealing with both of them is very easy and a real pleasure. Taking the wheel as Band Bus Driver was Megan Griffiths, an industry veteran who has spent 16 years at Phoenix – currently standing as the company’s only female driver. While Griffiths might seem like an obvious addition to Goulding’s team of strong women, her inclusion was a complete coincidence.